This week we farewelled the 2014 Independent Distributor Council (IDC), and welcomed the incoming 2015 IDC. USANA Australia General Manager, Geoff Watt, said working with the 2014 IDC has been a great privilege. "They certainly ensured that your voice was heard, and that our decisions and directions were the best they could be," he said. "They challenged us and encouraged us to work harder and smarter. Although we will continue to work closely with these Associates, the forums will be different. "On behalf of the entire management team in Australia and New Zealand, I want to say thanks to Janet Tan, Aimee Buhagiar, Louie Qu, Kate Gyngell, Mitchell Kochonda, Wei Cheng Che, Virginia Cheong, May Tan, Josie Tong, Michael Yek, Carolyn Edwards and Paula Gosney - it has been a great honour, and I am inspired by your knowledge, passion and dedication." Geoff said he was "proud to introduce the 2015 IDC". "These exceptional and committed USANA Associates have graciously accepted the challenge to be your voice and to help take us to new levels of success. The incoming IDC is comprised of 13 Associates, five from New Zealand and eight from Australia." Before Rita started a USANA business her focus was on her career as an accountant and a registered tax agent. At first she was only interested on using the supplements for her health but after seeing results decided to share with family and friends. Rita said she is “so proud” to be involved with USANA. 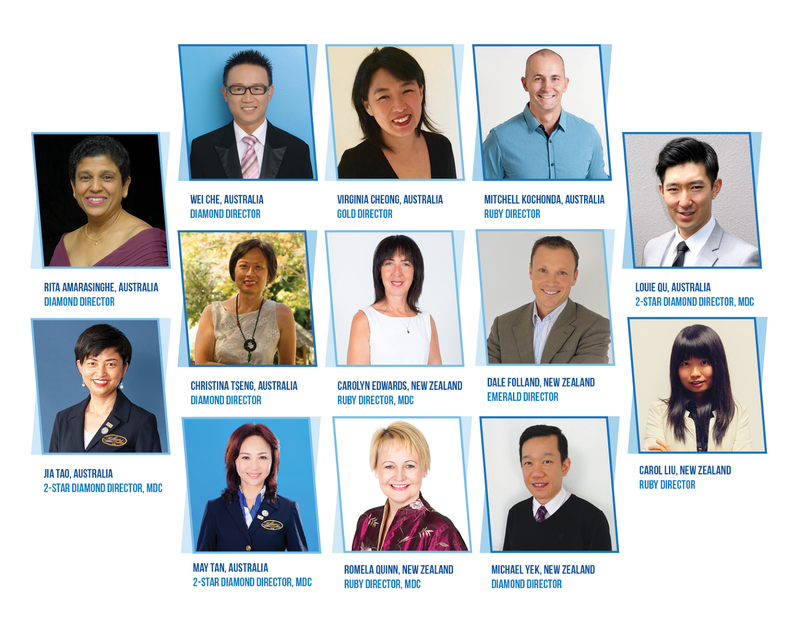 Wei Che is delighted to serve the whole USANA community as he accepts his role on the Independent Distributor Council. “I have always believed that if I help enough people get what they want, eventually I will get what I want! My natural willingness to help others has not only given me the opportunity to become a Diamond Director in the business, but it has also offered me an opportunity to serve the whole USANA community” he said. Before joining USANA Virginia worked as a lecturer and ran a consulting business. When her friend came to her with a business opportunity she wasn’t sure how it would fit into her life, but it has! Sport is one of the loves of Mitchell Kochonda’s life – he has the professional background of a physical preparation coach and has served athletes locally and globally from state to Olympic level for over a decade now. Beautician May Tan has a strong interest in health and beauty and loves to use USANA nutritional supplements and Sensé skincare products. She specialises in putting together an optimal health and beauty program according to peoples’ specific needs and help people develop a healthy lifestyle. Louie Qu began his USANA business at the tender age of 18 whilst studying his degree in Nutrition and Food Science at Monash University. Since graduating, Louie has worked on his USANA business full-time. As a Gynecological and Obstetric Professional, Jia Tao has worked in several hospitals in China, Singapore and Australia. Her passion and knowledge in nutritional science, and preventive medicine have helped hundreds and thousands of people. Jia Tao joined USANA in 2003, and now she is 2-Star Diamond Director and Million Dollar club member. Christina Tseng had a successful 25 year career in Singapore in various corporate environments and MNCs specialising in marketing and communications, public relations and journalism. She migrated to Perth in 2002 with the family for better work life balance and joined USANA in 2004. In 2005 she rank advanced to Silver Director, Gold Director in 2006, Ruby Director in 2007 and Emerald Director 2008. Christina was also AP Top 20 Pacesetter Creator in 2007. Currently she is a Diamond Director. Carolyn Edward’s work history ranges from travel, recruitment, and customer service to property management. She has been involved with USANA for the past 16 years now. After six years consulting in nutrition Dale was approached by a family member for his opinion on USANA’s products. Dale had never seen any nutritional product in New Zealand that stood up to USANA’s quality and started recommending them. Although at first a little hesitant at USANA’s business model, Dale made USANA a priority and a short time later left his job in nutrition. Before USANA Carol obtained an engineering degree major in software and worked for the largest software house in New Zealand as a systems consultant. After working seven years part-time in the business, Carol saw great results and decided to go full time in April 2015. Romela is a Ruby Director, a Million Dollar Club member and the 2000 recipient of the Dr Wentz Vision Award. Her journey with USANA began in New Zealand in 1998. She was one of the very first people to join USANA and is proud to be one of the pioneers of this “outstanding company”. Romela's belief for building a solid USANA business is to “take excellent care of your people”. Michael Yek is a Chinese physician and a professional Tai Chi instructor. His passion is to help more people gain true health and seize their opportunity to fulfil their dreams by building a USANA career. Geoff said "feel free to reach out to the new IDC if you would like issues raised on our regular IDC calls". He concluded by saying "please join me in thanking our 2014 IDC and congratulating the 2015 IDC!"